In medium bowl, combine salad dressing and egg; mix well. Add chicken, pimientos and 1/2 cup of the bread crumbs; mix well. 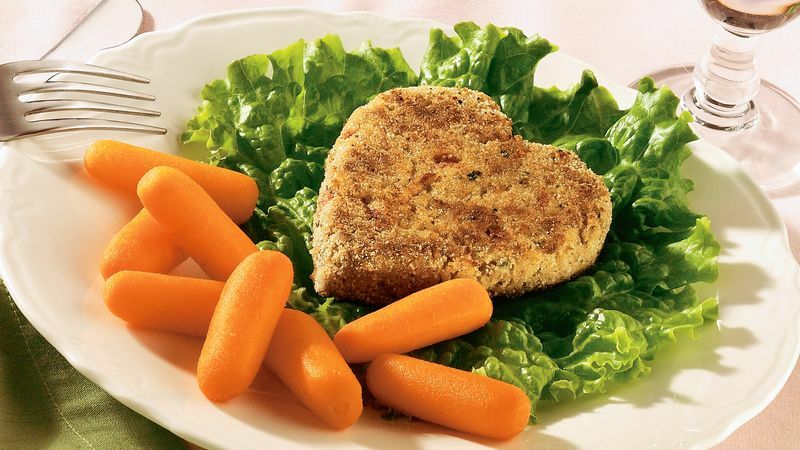 Shape mixture into 4 heart-shaped patties, 1/2 inch thick. (If 3 to 4-inch heart-shaped cookie cutter is available, use as a mold.) Coat patties with remaining 1/2 cup bread crumbs. Spray large nonstick skillet with nonstick cooking spray. Heat over medium heat until hot. Add patties; cook 8 to 12 minutes or until golden brown and thoroughly heated in center, turning once. If desired, serve patties on lettuce-lined platter with additional ranch salad dressing.